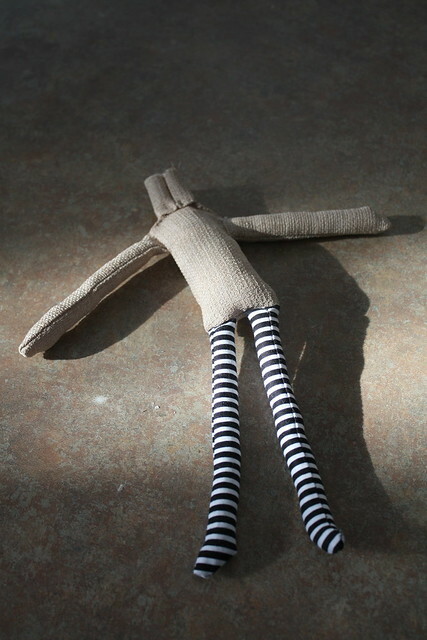 This is the progress shot of the doll. The head will hopefully be drafted/sewn soon. I’ve been feeling very much under the weather lately with a nasty cough, cold, and sore throat. I just hope I can do the doll justice. I may make another one just so I can tweak the pattern. I’m not sure yet. What are you working on? I hope you are all keeping the germs away! – Buttons! – Ok, so I found the yellow ones but I did take two sets of the black to see which would look better as eyes. – Burlap-like Fabric – Real burlap was really rough and the weave isn’t as tight. I got something that looks like burlap but the weave is much tighter and it catches the light better. – Black Rain Gear – This is for the skirt of the doll. I opted for this fabric because it’s heavier and it’s shiny. I can make a fuller skirt with it. – Coral Cotton – I believe it’s cotton and it has this subtle shimmer to it- the way it catches the light. This will serve as the shirt for the doll. – Blue & Black Yarn – This is for Coraline’s hair. – Yellow Burlap – This is for the raincoat. I tried finding something else that looked like the type of fabric they used in the movie but I couldn’t find anything comparable. I went with this because it was a nice colour and I liked the weight of it. 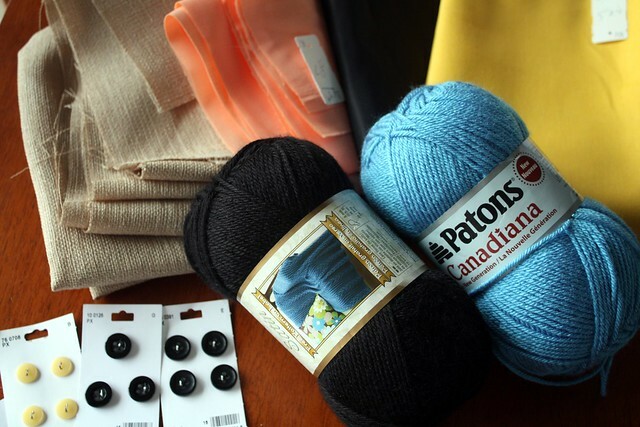 The total damage for the supplies (including 3 sheets of black felt not pictured) was $33.08. I’ll be starting the clip tonight. 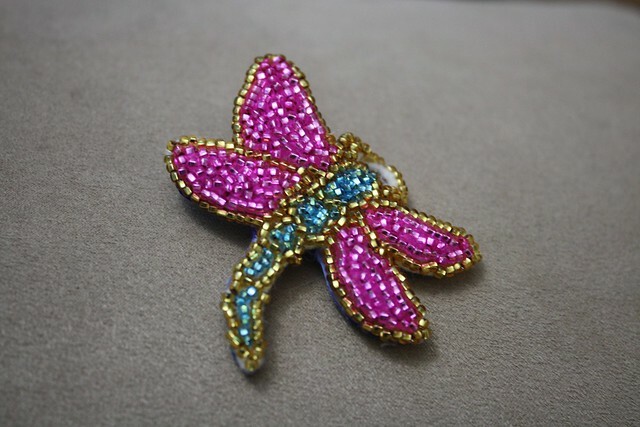 I am going to do beading embroidery to get the dragonfly clip done. I’ve also done a foil base form for the Seeing Stone. I should have progress pics by Monday. What are you planning this weekend? Natalie’s favourite movie is Coraline. Robert and I only go to one con a year and it’s Anime North. I thought it would be fitting that I finally took the plunge and go in cosplay. I chose Natalie’s favourite character Coraline. I will be going as the star-sweatered Coraline. I will need to find a sparkly navy blue mock turtleneck/turtleneck sweater which I will hand applique stars on. I’ll also need black jeans and blue boots. I figure I can find blue boots or paint any comfy pair of boots at Goodwill/Sally Ann. I’ll need to make the dragonfly hair pin as well as a 12″ Coraline doll. I can’t wait to get started on the replica doll. I’m buying the supplies on Friday. Of course, everything will be documented well in this blog. I want to make this cosplay good enough so I can email a picture to Neil Gaiman and Henry Selick. Actually, I need to impress my toughest critic first and that would be Natalie. I hope to get this all done by March. After March, I’ll have two months to work on the Doll North competition as well as stock for my Doll North marketplace table. The best part is getting my hair dyed and cut like Coraline’s. I’m excited about having blue hair. You are currently browsing entries tagged with coraline at Sushi Candy.